Calling all biscotti lovers! I can’t wait to share this Fruity Brazil Nut Jeweled Holiday Biscotti Recipe with all of you. The holiday period is fast approaching; and if you’re like me, it always starts off like a marathon: conversations with families and friends usually during the last summer barbecues, asking which family member will host, coordinating between both sides of the family, specifications and themes for the gift exchanges… and then, before you know it, it’s the middle of winter and it becomes the sprint of a lifetime… and you swear that it’s the last year that you are running this crazy race! The good news is that it does get easier with a little planning and prioritizing. It really is a matter of identifying, fine tuning and simplifying what is important to you, and then everything becomes a little more manageable. Take, for example, the whole issue of gift-giving and baking during the holiday season. When I realized, years ago, that cookies make fantastic hostess gifts, I started making cookies with a frenzied purpose. In order to help me organize myself, I started making a cookie calendar, which I would plan out in the fall. The cookie calendar helped me make a schedule of which cookies I would bake, and when, depending on how well they keep in the freezer. I would always start my cookie production in the beginning of December with biscotti week. Have you guessed that I have a thing for biscotti? Biscotti are easy to make, there are so many different varieties that can be made and they freeze super well! If you also have a thing for biscotti, you’ve come to the right place! And guess what? We are not alone! I would invite you to take notice of the wonderful collection of biscotti recipes shared by Food Bloggers of Canada. 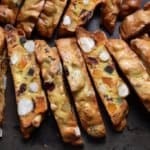 Over 30 biscotti recipes! 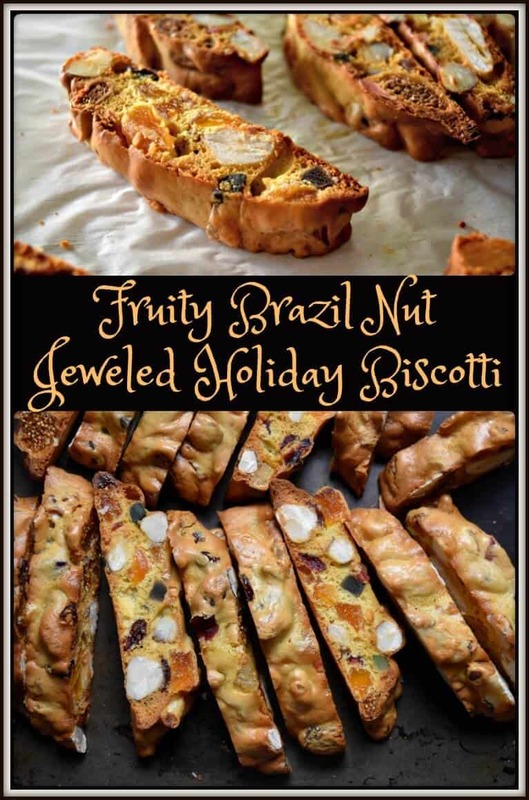 And today, I would like to add one more option for you to choose from – Fruity Brazil Nut Jeweled Holiday Biscotti Recipe. 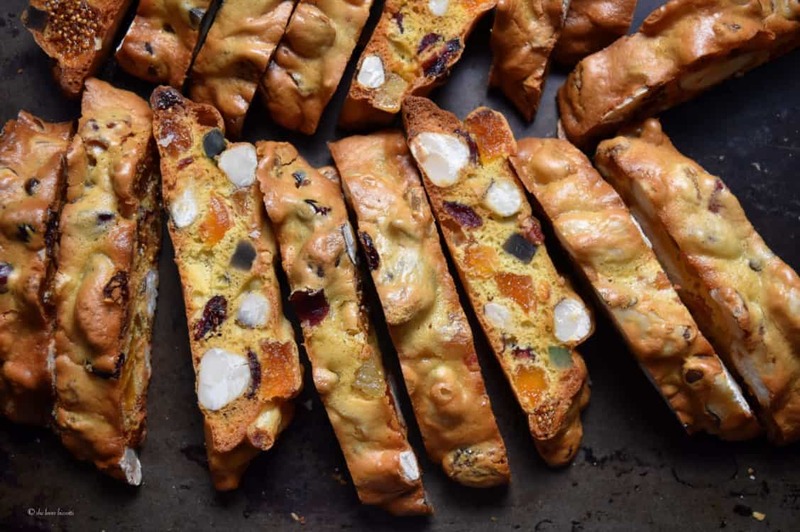 When I describe these Holiday biscotti as being fruity, that’s because it has dried figs, apricots, pineapple, cranberries, and mixed peel in it. 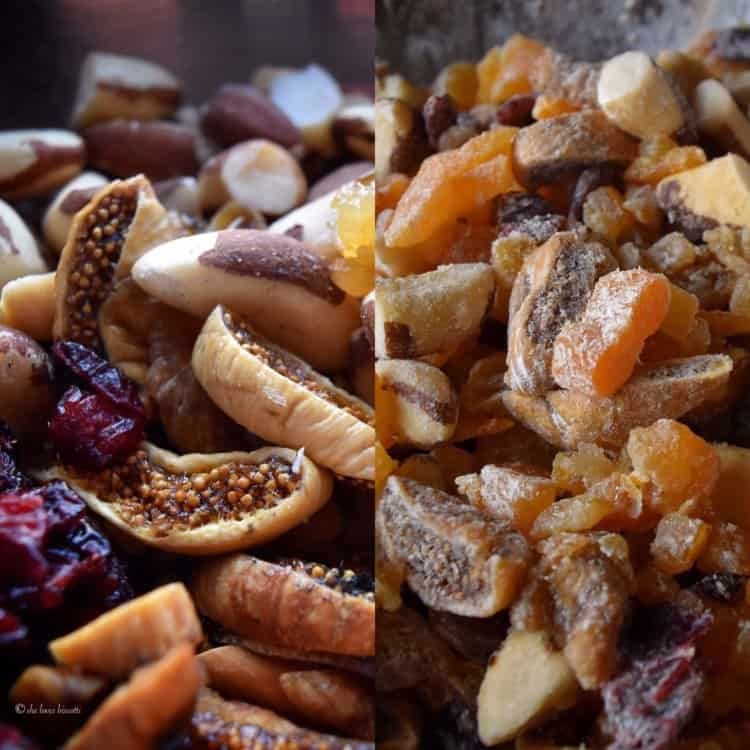 This wonderful dried fruit will get coarsely chopped and then combined with Brazil nuts and ½ cup of the dry ingredients. Try to separate the fruits as much as possible so that there are no clumps. Remember to leave the Brazil nuts whole as they will provide a wonderful visual once your biscotti are sliced. Once you have beaten your eggs, add the dry ingredients. And then gently fold in the nuts and fruit. You will notice that you cannot roll this batter into a log. What I do is drop large serving spoons of batter on a parchment lined cookie sheet in order to achieve the shape of two logs. (I also use this technique for these Simple Classic Italian Honey Almond Cocoa Biscotti). The biscotti will be rustic looking but they taste great! I was first introduced to this Fruity Brazil Nut Jeweled Holiday Biscotti Recipe when I was a teenager. Just like the recipe for the honey almond biscotti, the origin of this recipe can be traced to my Zia Maria. These biscotti were one of my mom’s favorite and her sister would often drop them off just because that’s what older sisters would do! I, for one, was always super happy to see my aunt popping in for a surprise visit – it almost always meant some biscotti and baked goods were coming our way! This is a very versatile recipe and as long as you keep the proportions equal, you can easily vary your ingredients. My aunt’s original recipe had maraschino red cherries which I replaced with cranberries. I also decreased the brown sugar by half. These Fruity Brazil Nut Jeweled Holiday Biscotti are not only a family favorite, they are also so easy to make. As a result, they are usually one of the first biscotti recipes that I make in preparation for the holiday season. Calling all Italian biscotti lovers! I can’t wait to share this Fruity Brazil Nut Jeweled Holiday Biscotti Recipe with all of you. In a large mixing bowl, sift dry ingredients together, set aside. In a medium mixing bowl, combine the cut up fruits and the brazil nuts with ½ cup of dry ingredients, set aside. In a mixing bowl, or bowl of electric mixer fitted with whisk attachment, whisk the eggs on medium high speed for about 2 minutes. Add brown sugar and vanilla extract and whisk for another 2 minutes. Add the remainder 1 cup of dry ingredients and whisk until just incorporated (do not over mix). Fold in chopped fruit and brazil nuts. 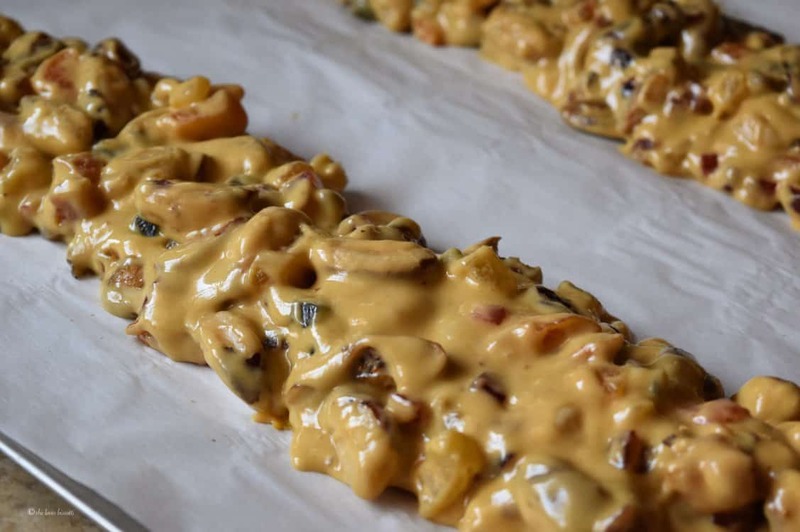 With a large mixing spoon, place mixture and parchment lined baking sheet. Form into 2 logs (refer to explanation in text of article). Bake for approximately 25-30 minutes or until firm to the touch. Remove from oven and allow to cool down. Using a serrated knife, slice cookies about ½ inch thick. 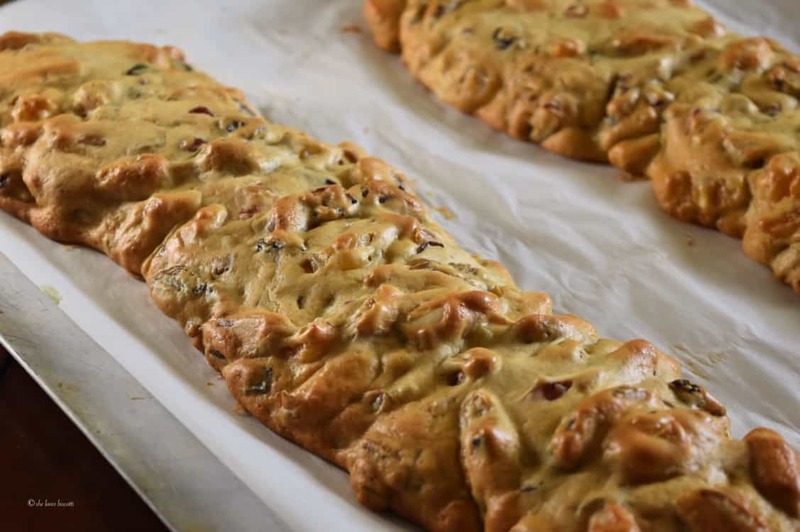 Optional: Place sliced biscotti on the baking sheets, and bake for about another 5-10 minutes (the longer they stay in the oven, the crispier they get). Can be stored at room temperature for a few weeks...if they last that long. Can also be frozen. Just chanced upon your Fruity Brazil Nut Jeweled Holiday Biscotti recipe and can’t wait to make it. Just curious, I don’t see any “oil” in any form in the recipe. Is that correction? A very yummy snack and a fantabulous gift idea for the lucky recipient during holidays! Biscotti always reminds me of the holidays! This one definitely looks ‘jeweled’…it’s jam packed with so many delicious ingredients! YUMMY! These look AWESOME Maria! I’ve never made biscotti myself, but it’s something I’ve toyed with for a while. Seeing the process here makes me more interested – I didn’t know you could do it in a drop-style, rather than rolled out. Love the combination of Brazil nuts and dried fruits. I know that dried fruits get something of a bad reputation at the holidays but I think that good quality dried fruit is something to be celebrated, and definitely worthy of inclusion in a treat like this! Thanks for the recipe and for the shared memories. Cheers. I have only ever made biscotti once, a long time ago. It was a success and everyone loved it. This one looks fantastic and has reminded me, once again, that I should give it a whirl! Great recipe! Thanks so much Julia ♥ Hope you get a chance to try them 🙂 Thanks for dropping by. These are beautiful! Perfect for the holidays! Oh my! These biscotti are just LOADED! I love all the dried fruits you’ve included. What wonderful family traditions you have! Pinning! Oh my – just printed and pinned. Definitely on my list to make for the holidays. Love it. 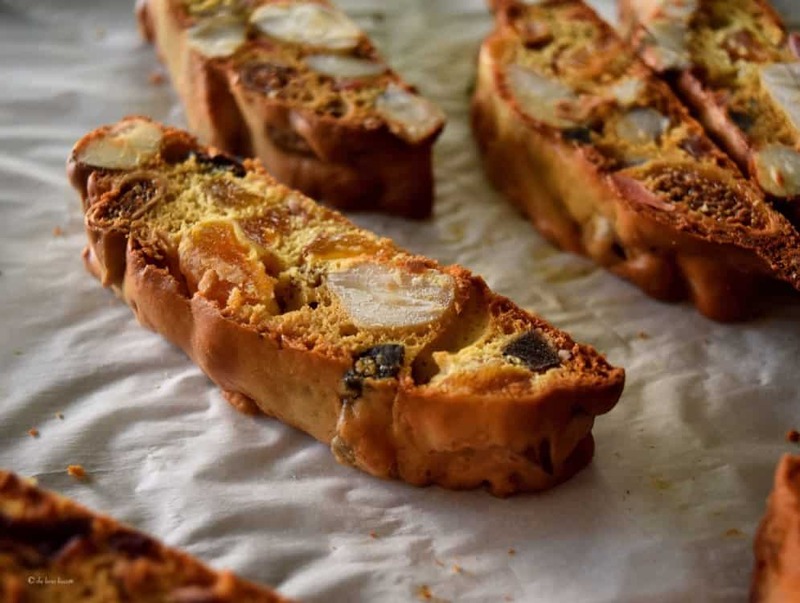 This is a biscotti recipe after my heart – I adore the mix of dried fruit and nuts and look forward to baking a batch after the holiday. Thank you for sharing your special family memories. Thank you so much Paula! Enjoy 🙂 Wishing you and yours a Happy Thanksgiving!